This Kavacham was tahught by Sage Agasthya to his wife Lopamudhra. In Sudawapuri (Porebandar) Gujarat, there is an Ekadashi Hanuman temple inside the Shri Panchmukhi Mahadev temple. Raam Bheeja vachyo Hrudayam pathu may kapi nayaka. From what has been told by you to me. The armour of the eleven faced Hanuman. The Lord addressed Lopamudhra and recited continuously without stop. And so please hear them from me, oh pretty one, with reverence. Is wish fulfilling, holy and protector of the family. And the strength is wind god and the chanting is being started. Let Vam the singing of the seed, the son of Anjana protect my arms. Ley Hasom the god who pervades the seed, the terror of Lanka protect my middle. Let Ram soul of the seed, the one who won over old age protect my thighs. Let the God who lifted the Dronachala protect my feet and its upper part. In the south the head of Narasimha, in the south west is Ganapathi. In the north west is that of Bhairava and in the North Kubhera protect us always. Let my all edges be protected by Rudra who is in the north east. Let the horse head at the top who is pleasant protect my private parts. It takes us to heaven and leads to holy thoughts and principles. Unless it is read forty thousand times by the practioner. Or two weeks or three weeks he would get long life. By the practitioner without doubt, within a year, he would see Him. If this as recited by Lord Brahma is practiced within oneself. Saluted at the feet of her own husband. Who is the valorous Hanuman who is the killer of all one’s enemies. Thus ends the armour of seven faced Hanuman which occurs in the book Adharva Rahasya. Sri Panchamukha Anjaneya Swami was the main deity of Sri Raghavendra Swami. The place where he meditated on this five-faced form of Hanuman is now known as Panchamukhi. There is also a shrine for Panchamukha Anjaneya Swami at Kumbakonam in Tamil Nadu, India. A., 40 feet (12 m) tall monolithic green granite murti of Sri Panchamukha Hanuman has been installed in Thiruvallur, Tamil Nadu. This place was known as Rudravanam in olden times when many saints and seers had blessed this place with their presence. The Panchamukha Hanuman Ashram itself was established by a saint called Venkatesa Battar. Hanuman assumed this form to kill Mahiravana, a powerful rakshasa during the Ramayana war. Mahiravana had taken Lord Rama and Lakshmana captive, and the only way to kill him was to extinguish five lamps burning in different directions, all at the same instant. Hanuman assumed His Panchamukha form and accomplished the task, thus killing the rakshasa, and freeing Rama and Lakshmana. 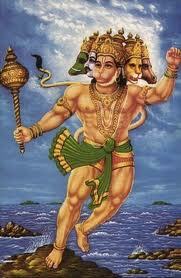 This form of Hanuman is very popular, and is also known as Panchamukha Anjaneya and Panchamukhi Anjaneya. One of the most famous places of Pligrimage in central India is claimed to be the Resting Place of Shiri Hanuman Ji is Chitrakoot. The Hanuman Dhara Temple is situated on the peak of mountain where there is natural rock formation image of Shri Hanuman inside the cave and a natural stream of water falling on the tail. It is believed that after the coronation of Lord Ram, Hanuman requested for a permanent place to settle in the Kingdom of Lord Ram, where his Injury of burns on his tails will be cured. Lord ram then with his arrow spurred a stream of water on the tip of mountain and asked hanuman to rest there and water of the stream will fall on his tail to cool down burning sensation on his tail. The access to the cave temple is through stairs starting from bottom of the mountain to its top. It takes roughly 30 to 40 minutes to reach the temple. 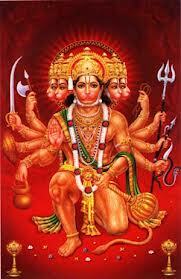 Over time the temple has gained a new name, namely Hanuman Dhara. The cave temple is located on the top of the mountain and water comes in the stream throughout the year, although the mountain has no permanent source of water on it like Glaciers or snow coming from the covered mountains of Himalayas. 67 foot Murti of Lord Hanuman Ji has been installed at Sankat Mochan Shri Hanuman Mandir, located in the Punjab town of Phillaur. 40 foot Murti of Sri Panchamukha Hanuman has been installed at Tiruvallur, near Chennai,India. 36 foot Murti of Sri Panchamukha Hanuman has been installed at Panchavatee,Pondicherry, called Viswaroopa Jayamangala Panchamukha Sri Anjaaneyaswamy. 32 foot Murti of Adhivyadihara Sri Bhaktha Anjaneyaswamy, Nanganallur, Chennai which is molded out of a single rock. Sri Hanuman faces east. He grants purity of mind and success. The Narasimha faces south. He grants victory and fearlessness. The west facing Garuda removes black magic and poisons. The north facing Varaha, showers prosperity, wealth. The Hayagriva mukha faces the Sky. But since we cannot see it, it is usually tilted and shown above Hanuman's face. Hayagriva gives Knowledge and good children. 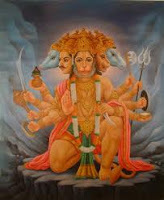 This Kavacham is addressed to this fierce form of Hanuman. This Kavacham is not a stotra but a tantric mantra aimed at providing protection to the chanter. Some people believe that this sloka should not be recited but used to worship the five faced Hanuman. It is written at the end of the stotra that it was taught by Rama to Sita as per her request. But the first few lines show that this is a version was taught by Garuda, where he mentions that it was created by the Lord of lords. Om for armour of the great armour of the five faced Hanuman, sage is Brahma, Gayathri is the meter, God addressed is the regal five faced Hanuman, Hreem is the root, Sreem is the power, Kroum is the nail. Kroom is the armour and Kraim is the arrow. Thus all directions are tied. And had ten hands and would grant all desires. With protruding teeth in a black face, which is curved and angry. Which is very serious, the god being fearsome and a destroyer of fear. And which cuts away underworld, Lion, ghosts, fever and sickness. By using which face the chief of Brahmins killed the great asura called Tharaka. Would put an end to all the enemies and lead to salvation. Sign of protection and also Jnana in his ten hands. Wears a divine garland and anoints himself with divine ointments. Who has red eyes and who is the first always. Please save me by killing all my enemies, Oh God who lifts people from danger. Om, if this divine chant of the monkey of Vishnu, monkey of Vishnu is written on the left side, the enemies would be destroyed, destroyed and the contrary aspects would be pardoned, pardoned. Om my offerings through the fire to the five faced God who has monkey face on the east side and the God who destroys all our enemies. Om my offerings through the fire to five faced God who has the black face of Narasimha on the south side and to the God who hurts all beings. Om namo bhagawathe Pancha vadanaya, paschima mukhaya garudananaya sakala visha haraya swaha. Om my offerings through the fire to five faced God who has the face of Garuda on the west side and to the God who cures all types of poisons. Om namo bhagawathe Pancha vadanaya, Uthara mukhaya aadhi varahaya, sakala sampathkaraya swaha. Om my offerings through the fire to five faced God who has the face of the primeval boar and who blesses with all types of wealth. Om namo bhagawathe Pancha vadanaya, Urdhwa mukhaya, hayagreevaya, sakala jana vasankaraya swaha. Om my offerings through the fire to five faced God who has the face of god hayagreeva (horse) and to the God who attracts all beings. Sri Rama dhootha hanumath prasada sidhyarthe jape viniyoga. Ithi rishyadhika vinyaseth. Om for the great chant of the five faced Hanuman, the sage is Lord Ramachandra, meter is Anushtup, the god addressed is the five faced Hanuman, the root is Hanuman, the power is the son of Wind God, the nail is the son of Anjana, and the chant is being done to please Hanuman who is the emissary of Sri Rama. Thus do the preliminaries starting from the sage. Om salutations to he who has five faces through the entire palm. Gadwangam phani bhooruham dasa bhujam sarvari veerapaham. Sword and moves with his body all over the earth and is valorous everywhere. Shad prayoga gama Pancha mukha veera hanuman manthra jape viniyoga. Fire offering with the chant “Hari markata markataya lum lum lum lum lum” with a prayer to attract all types of wealth. Fire offering with a prayer to keep away ghosts dead souls, devils, Brahma rakshas, Sakini, Dakini,and to prevent effects of the planets in the sky, evil created by thalismans, thanthra done by others and evil chants. Fire offering with prayer to the five faced hanuman who manages all useful acts jam jam jam jam jam, with a prayer for the blessings of Lord Ramachandra. For a period of one week would destroy all one’s enemies. Reading daily for three weeks would bring all sorts of wealth. Reading daily for seven weeks would give us all the world’s luck. Reading daily for nine weeks would result in the pleasures of a king. Even a thought of this armour will give him great strength. Ithi Sudarsana samhithayam Sri Ramachandra Sita proktha Sri Pancha mukha Hanumath kavacham sampoornam. Thus ends the “armour of the five faced Hanuman” which occurs in Sudarasana Samitha and has been told by Lord Rama at the request of Goddess Sita. తరతరాలుగా యావత్తు మానవాళి హృదయాలను చూరగొన్న అజరామర ఆది కావ్యం రామాయణం. ఈ క్రింది తొమ్మిది శ్లోకాలను పారాయణ చేసిన వారికి బుద్ధిబలం, యశస్శు, ధైర్యం, నిర్భయత్వం, రోగవిముక్తి, నవగ్రహ ఉపశాంతి, వాక్పటుత్వం మొదలగునవి అనుగ్రహమవుతాయి. Shree Panch Mukhi Hanuman Kavach is considered the God of power and strength and is worshipped by millions every Tuesday. Hanuman Kawach correctly energized by prayer and meditation is the protective shield, which will protect the wearer against all evils and perils. It Fulfill all your dreams come True with Shree Hanuman Kavach and Hanuman. This armour has been told by Lord Shiva to Goddess Parvathy. The lord first tells a prayer of twelve names addressed to Hanuman and then quotes the Hanuman kavacha as taught by Lord Rama to Lord Vibheeshana. Unlike other Kavachas of Hanuman, this is a simple prayer and not a tantric text. mama sarva karyani sadhaya sadhaya. Banda banda, Lunta lunta, Viluncha viluncha, Kili kili sarvaka yanthrani dushta vacham Om Phat Swaha. sahya karana parocchaatana kumara Brahmacharya gambheera shabdhodhaya Om hreem Sarva dushta graham nivaranaya swaha. Om namo hanumathe pavana puthra vaiswanara mukha papa drushti, shoda drushti, hanumathe Aagnaa phure swaha. Swagruhe dware pattake thishta thishtethi thathra roga mayam raja kula mayam nasthi thasyocharana mathrena sarve jwara nasyanthi,Om hraam hreem hroom ghe ghe swaha. Was asked by Goddess Parvathi, as follows. How can people afflicted with sorrow get protected for ever? And become even minded and get out of sorrow? Of What was told by Lord Rama to Vibheeshana long ago. Which is secret but specially being told by me. Who is extremely pretty and very greatly learned. He is the one who is the darling, son of wind God. He is the who gave life to Lakshmana, He is the one who hurt the pride of Ravana. And we would never have fear at the gate of the king or in forest cave. And who set fire to Lanka afterwards. 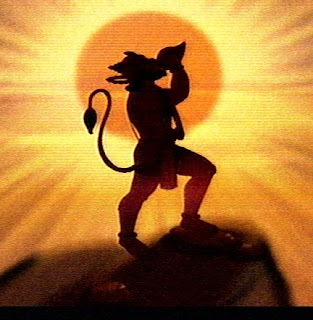 Om, salutations to Hanuman, let all the bad effects due to all planets, devils, past, present and future and evil spirits which are near by, be driven away, driven away. Let others strength diminish, And let all my deeds attain with success. Let the evil charms and chants done by others, the jealousy of others,, the effect of Ghosts, corpse and devils and let all blockages created by evil people, let evil knowledge and let all great fears be cured, cured. Let the evil designs of other charms be tied and made in effective. Ablations to the fire. Om For the great chant of the Armour of Hanuman, the sage is Sri Ramachandra, The god addressed is the divine Hanuman,Meter is Anushtup,, The seed is the son of Vayu, The strength is the son of Anjana, the nail is the giver of life to Lakshmana, The arrow is the messenger of Rama, The armour is God Hanuman, The chant is red eyed one who is greatly valorous, and this is being chanted by the orders of Rama so that Sri Rama would be pleased and all the desires of my mind are get fulfilled. Om Hrah salutations to he who cures Brahmasthra through the entire palm. Who is with red eyes, who is son of wind God and who wears yellow silk. Who likes his devotees, who is saluted by sages and likes the sound of chanting of Vedas. And an extremely shining lotus like face. And who is rising to standing position in the south. Om Hanuman who has shining body, who is decorated by his fame, who was born to Anjana, who gives pleasure to Rama and Lakshmana Who shines in the army of monkeys, who climbed the mountain, who helped Lord Sugreeva, who is a youth observing celibacy, who has a booming regal voice, Om Hreem Please cure the ills caused by all planets. Break, break, Pierce pierce, ghost groups, devil groups, fever caused by devils, fever caused by dead ones, fever of the fourth type, Brahma Rakshasas, the act of cutting by ghosts, fever caused by Vishnu, fever caused by Shiva. In our own house, near the gate, keeping on a plate and by chanting.” Om hraam hreem hroom ghe ghe swaha.” Diseases and fever would leave for ever. And let middle and down portion be protected by devotee of Vishnu. The place in the middle of eye brows. And let the king of monkeys protect my neck. As well as the one who put an end of pride of Asuras. Let my sides be protected by the great armed one. Let the son of wind god protect my hips. Let my knees and thighs be protected by Him who destroyed Lanka’s buildings. Let the carrier of the mountain and he who is near to Sun protect my feet. Let all my hairs be protected by him who controls the soul. That man with great devotion would attain happiness and salvation. And that gentleman would make all the wealth his. He would get rid of the three sufferings due to Tuberculosis. Epilepsy and Leprosy. Would get mountain like wealth and be victorious in war. 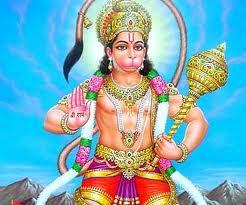 Great presence and mastery over words, would be one’s, if he meditates on Hanuman. And all sorrow will vanish from him. And he who wears it in his hand would become greatly wealthy. He would immediately get freedom and continue to be like that. Would get long life,health and children and would be praised by the famous. By men with devotion instead of reading it alone. Then the reading by such men would be a waste. For, reading with devotion the armour of Rama and Hanuman is specially good. Thus ends the armour of single faced Hanuman written by Lord Rama.